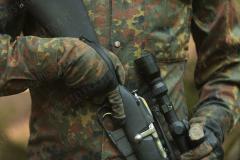 German Bundeswehr general purpose combat gloves with leather palm. These also have a light lining, but they're not really winter gloves: pick a close-fitting size and you'll be able to manipulate buttons, levers and such. If you know what Mechanix gloves are you'll know what to expect. Used surplus. The Germans have thin and form-fitting aviator type gloves for the summer heat, these on the other hand are a bit thicker for cool weather. Still these certainly aren't no-can-doo mittens, but something you can comfortably wear without taking off to pick your nose. 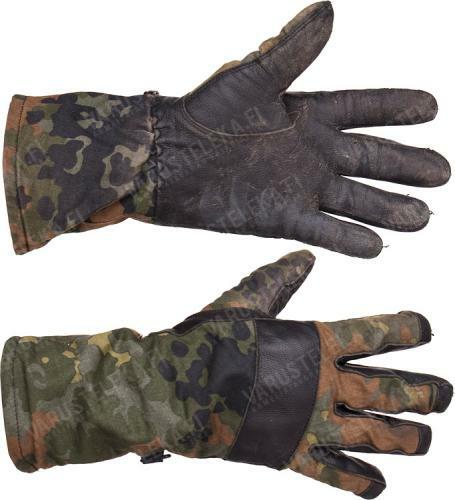 The shaft and back of hand are durable fabric with a Flecktarn camo pattern, the palm and fingers are reinforced with black leather. Overall this glove provides good mechanical protection and concealment. The number indicates the widest circumference of the palm in inches. Pick a close size, these don't work as intended if worn loose. Quite often the fingers are a bit stubby, so if you're tall and slender, some other glove might be a better choice. In used but serviceable condition. Being military issue, they do have some wear on them. Aivan täydelliset juuri tuotekuvauksessa ehdotettuun inttikäyttöön. PV:n tarjoamat puutarhakäsineet ovat mitä ovat joten hommasin kuukauden niillä kärvisteltyäni tällaiset tilalle. Touko-elokuun välillä hieman turhan lämpöset, muuten kulkivat koko vuoden käsissä. Toimii hyvin jopa yli kahdenkympin pakkasilla hiihdellessä, tauoille sitten vaikka noukkarit käteen. Kestivät koko palveluksen, ainoastaan asekäden peukalonhanka alkoi repsottamaan loppuvaiheessa ja oli helppo ommella takaisin kasaan. Kun hommaat oikean kokoiset onnistuu kaiken maailman näpräily aseiden käsittelystä aina radioiden ja räjähteiden kanssa pelaamiseen asti ihan yhtä hyvin kun mechanixeilla. Itse pidin näistä mechanixeja enemmän hanskan varren takia, maassa ryömiessä on kiva etteivät kaikenmaailman risut ja männynkävyt töki ranteisiin. Jos näitä sais ihan vaan mustina käyttäisin siviilissäkin. mitä joutuu maksamaan oman kokoni hansikkaista; onneksi ehdin ostaa useamman parin ennen hinnannostoa! niin sopivat tällaiset ovat minulle kasipuoli-kokoa. The material is bombproof and last a long time, the stitches tend to tear after a while, but easy to fix with some time and a needle. These are some super comfortable and ergonomic gloves. The leather is tough and the lining is soft.Mine had hardly been worn, so I bought a 2nd pair. Also hardly worn. Hyvät työhanskat ja menee muissakin hommissa. Ilo vetää käteen joka kerta. Aivan mahtavat hanskat! Istuu kuin parempikin prätkärukkanen käteen, vaikka on ohut vuorikin pehmentämässä tuntua omaan nahkaan. Joutuu varmaan tilaamaan toisetkin ihan varalle. Suosittelen lämpimästi. In pretty great condition except for a blown seam on the leather of the left middle finger and a few subtle repairs. Definitely some solid gauntlet cut tactical gloves. Leather is in great shape and the flecktarn isn't too faded. Mine were in perfect condition, had that beautiful musk of storage and fit perfectly! Mine arrived in great shape and fit really well. Perfect for a mild winter climate. Mine arrived in pretty good condition, only minor wear on them. After some light cleaning and conditioning them with mink oil, they were practically good as new. These gloves fit true to size and are quite comfortable. I wore them playing paintball and they felt great to wear. Only thing to note is that since these gloves do have a light liner in them, they can get warm and sweaty if worn during summer weather, but are perfect for mild weather. Decent item. Mine came without the lining, but still good value. Recieved in great shape, and was very sturdy in use. My 8.5 were like new, much better than those in he photo. Impressed with the quality. A great balance between fit and warmth. I live in Victoria,BC, Canada which has mild damp winters, these will make perfect gloves on cooler days. The way they extend makes them perfect for comvining with my Swiss M70 field jacket as it has shorter arms. Amazingly well built robust gloves perfect for keeping your hands protected and warm. Todella hyvät ja napakasti sopivat hanskat. Todella loistavat hanskat. Olleet vuoden käytössä retkihommissa ja en muita hanskoja enään ottaisi. Itselle netistä tilattuna osui vielä käyttämättömät hanskat. Saksalainen osaa tehdä mulle sopivia autoja ja näköjään hanskojakin. Mittasin kotikonsteilla käteni kooksi 8 ja sen mukaan tilasin: täydellinen sopivuus! Hanskat ovat selvästikin käytetyt, mutta hyväkuntoiset. Käsittelin nahkaosat mehiläisvahalla ja nahka palautui lähes uuden veroiseksi. Hanskojen hellää käsipesua mietin, mutta näääh... kyllä näillä ampuu. Suosittelen! Light but strong. Mine seemed pretty new. I have used these for a decent number of hours now and there has been no problem. They are not waterproof, but they keep out more water than I thought they would. Toisesta hanskasta puuttuu vuori. nyt pitää repiä vuori toistakin niin saan itselleni liian isot kesähanskat. Harmi kun kesällä poistin vanhoista hanskoista vuoren .... varmaan saisin vaihdetuksi hanskat mutta en jaksa enempää vaivaa nähdä. Just great! Seems like these are thicker than my previous pair. I got a perfect condition pair and they fit very well, best fitting glove i have! Onneksi tuli aikoinaan ostettua muutama pari. Parhaat toiminta-hansikkaat. Sopii mainiosti myös matalien vuorien valloitukseen. Erittäin toimivat ollut mm. koiralenkeillä. I love these! Plenty of dexterity, warmth, and quality came built in! Super cheap for the quality. Simply put I love these gloves. I've been wearing them for almost all outdoor work I do since July 2017 and only now am I starting to see some wear in the leather and stitching, and not even enough to worry about. The gloves do have a liner in them but below -10c they really don't work well as winter gloves and your hands will get cold. They do work well as driving gloves and thin gloves when you still need dexterity in the cold. In high heat they will be very warm, but they do seem to breath better then full leather gloves. The gloves, 8.5 for me, fit very well for my long fingers. I've found it hard to find gloves that fit well and was very happy with these. They do have the extra long wrist protection, so they will tuck under shirts or just act as protection. If needed they can be folded up to make them shorter/cooler. Finally my gloves arrived in like new condition, and for the price they cannot be beat. I am getting a second pair so when I use up my first pair I will not be without. Ostin kaksi paria, ns. oikean koon ja toiset puoli numeroa liian isot. Hanskat istuvat mainiosti, tosin sormet saisivat ehkä olla hilusti pitemmät. Isommista saa oivat talvihanskat laittamalla neulehanskat alle. Kumpikaan pari ei ollut pahasti kulunut. Rasvaa pintaan ja nahkaosat olivat kuin uudet. Toisen parin hanskat näkyivät olevan eri tuotantoerästä, nahka oli erilaista. Tosin käytössähän tuo ei mitään haittaa. outstanding condition. good fit but the germans have short fingers indeed. It is pointed out in the description that the gloves have stubby fingers, for me they seemed incredibly stubby, but, DIY work with scissors fixes this. Look closely near the fingertips, the area shortly after where the stitching ends is where you should cut. Cut in the section after both sets of stitching so that the flecktarn fabric does not fray. Then at your discretion pull the inner material forward and cut off as much as you feel you need to of that. So far the gloves are very comfortable and show no problems with the "modifications" made. So glad I finally grabbed some, they're as perfect as the pictures show : perfectly serviceable used gloves. They're tight yet comfortable since they're used, the palm definitly show a bit of wear, but the rest of them is just rock solid. The price was just a steal in my case, I love them. Probably THE cleanest v and best fitting pair of surplus gloves I've purchased! I have an 8.5" hand and, medium fits perfect! JUST enough room for liners, should I feel so inclined.